You don't want your kid to do a certain thing, but he makes sure he does it. What would your reaction be? You are definitely angry and you scream and yell at him. Later, you feel so tired, exhausted and wonder why you couldn't handle it with patience. Sounds familiar? Most parents yell and scream because they are frustrated. The frustration could be because of their kid or otherwise. At that particular moment, you feel as if someone has just pulled the trigger and in a second you have done enough damage which you do not realise. Every parent's aim is to teach their kid to be neat, well behaved and disciplined. But as parents, we should never forget that they are still kids. Give them their space to explore their own environment and learn new things every day. Screaming or yelling would restrict them from exploring things around them. This habit actually restricts them from learning and can lead to slower learning in children. Knowing this, I am sure you would want to know how to control it. Here are a few ways to do it. • If you have an argument with your kid, listen to what he has to say about it. In doing so, you are giving him an opportunity to speak his feelings and experience the situation in a way that will benefit him. Also, you will get enough time to think and calm yourself down. • When you know you are losing your temper, make sure you take a deep breath and remind yourself of the guilt you will face after yelling. This diverts your mind and helps you calm down. • Observe the things that make you yell. You may be losing your temper to put back your kid's toys in place because he wants to play with all his toys at once. Have a check on it. Make things easier for yourself by giving him a limit on how many toys he can play with at a time. • Keep your expectations low. He is just a kid and is yet learning to be responsible which would take a long time. • Spend more time with your kid so that both of you can understand each other better. Play with him so that you can be friendlier in conveying things in a manner that he will understand. • When you know you are getting angry, start whispering to your kid. You can probably whisper in his ear. The impact of whispering is higher and hence easier to communicate effectively. • If your kid is not paying much attention to what you are saying, then don't take it personally. Change the topic that can get your child's interest and gradually connect or return to what you were trying to convey. 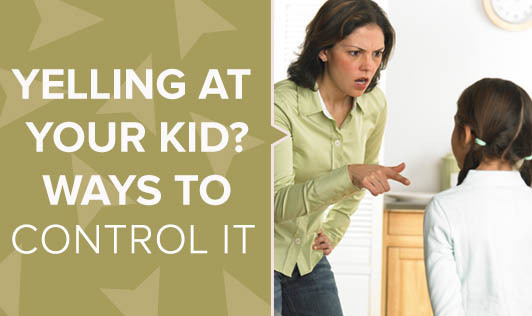 Parenting is a very stressful job and kids may continue misbehaving in spite of all the yelling.. Watch out for signs when you are not in the best of moods or angry and try to stop yourself from yelling before it happens. Some of us may have been victims of such practices and in a way, may know how it has affected us. Therefore, make a sincere effort towards being a responsible parent.